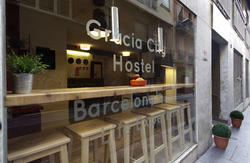 Besides of it's highly central position, Passeig de Gracia with Diagona Avenue, Nikbor is an international focused hostel, the perfect place where you can meet new people all over the world and make new friends. 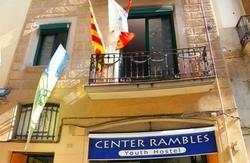 Our freshly renovated hostel offers free internet access, free delicious breakfast, a fun lounge with TV, Wii, Foosball and outdoor terrace. Also Nikbor's neighbor and friend is Casa Gracia Hostel, here you can enjoy art expositions and special events. If you want to check in early you are welcome to leave your luggage here until the room is ready. There are signs inside the terminal to the train platform. Buy a T10 ticket (this gives you 10 journeys on all metros/ subways, buses and trams in central Barcelona). From the airport there is only one train leaving towards the city, so you can't miss it! Get off at Passeig de Gracia station. Here you have two options: either come out of the station and walk 4 blocks up to Passeig de Gracia 114 or change from the train to the metro/subway L3-green line, and get off at the next stop, Diagonal. The Aerobus (shuttle bus from the airport to the city center) leaves directly from outside the terminal (signs in the terminal building) and takes you to Plaa Catalunya. 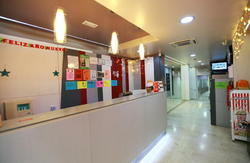 Here, you can take the metro L3-green line from Plaa Catalunya to Diagonal. We're 2 minutes away from Diagonal metro stop. Come out and walk to Passeig de Gracia 114. Take the bus to Estaci de Nord, Barcelona. Here, you take the metro from Arc de Triomf L1-red line to Plaa Catalunya. At Plaa Catalunya change to L3-green line and get off at Diagonal. We're 2 minutes away from Diagonal metro stop. Come out and walk to Passeig de Gracia 114.